Breaded mushrooms have been a staple in my life as far back as I can remember. My mom would make them frequently, along with her breaded chicken (using the same method.) My sister and I love them. I am sure my brother would too, if he liked mushrooms… He always has loved that chicken though! I find I am spoiled by these breaded mushrooms. 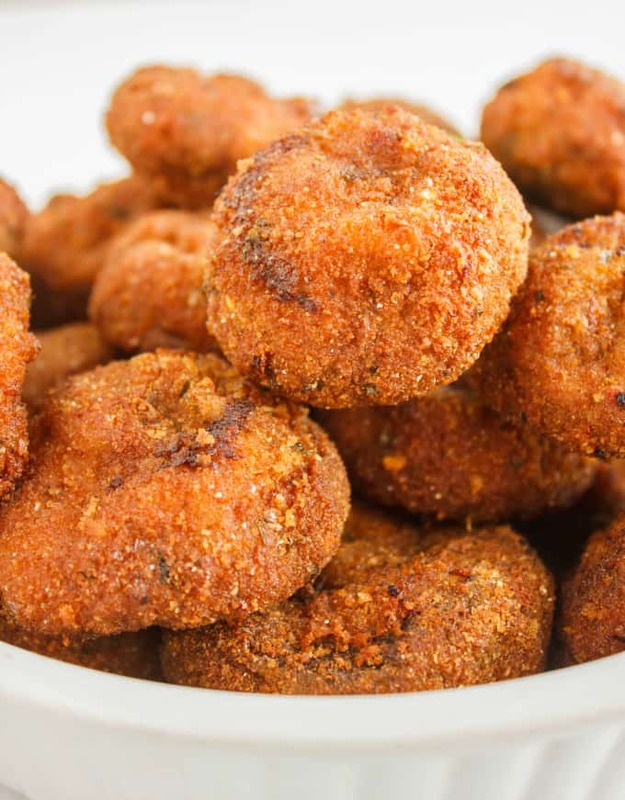 Whenever I go to a restaurant and order breaded mushrooms (very rare since it is something I can easily make at home,) I tend to get disappointed. There is always something missing. Whether it not being crispy enough, or lacking in flavour, or just plain falling apart, there is always something. Don’t get me wrong, I have had some nice breaded mushrooms are restaurants, however, homemade just seems like the way to go. Any time I do make these delicious mushrooms, I always need to send a picture to my sister to make her jealous! Then I send a picture to my husband, who is usually away camping when I make them (they are my special treat when it is just me.) I find since I have had Éowyn, my breaded mushroom making has decreased. Probably not a bad thing when it comes to deep-fried foods, but I must admit, deep-frying anything makes me nervous… For some reason, I fear the stove catching fire. I never leave the stove, and I use a thermometer to keep an eye on the oil, but I just feel more comfortable when someone else is around. Then there is the fact that I have a child running around and that is enough to stop me from frying anything! But I have the new stove now, and Éowyn is at an age where I can sit her down and explain how dangerous oil is. She had no problem staying out of the kitchen, and actually went about making her own meal in her toy kitchen. The flat-top stove had me much more relaxed while I was deep-frying the mushrooms, but I still was cautious. One day I will relax while making these! Whenever I see chefs cooking on TV, I always cringe at the oil splattering everywhere over a gas stove top! Of course, those industrial kitchens are much more equipped with ventilation, but still… Sigh, it isn’t even like I have been in a fire before, I just worry about fires happening on my stove or in the oven. I am sure I am not the only one. 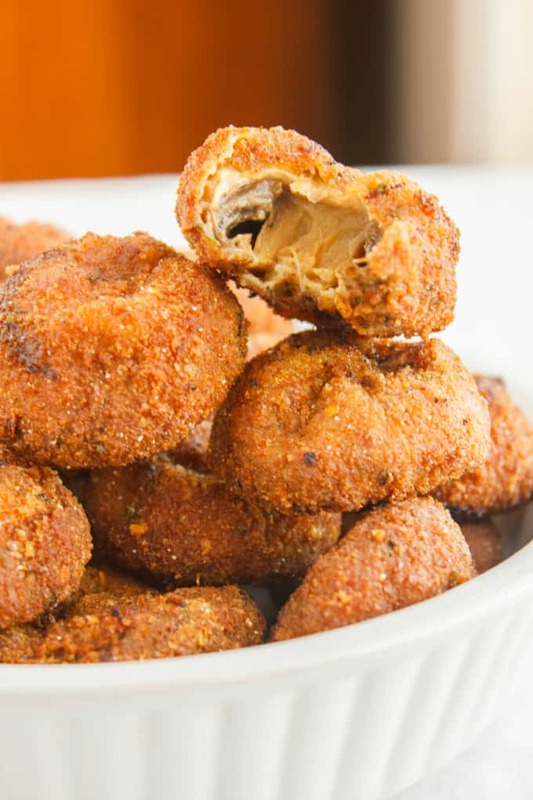 That aside, these breaded mushrooms come out crispy and packed full of flavour! My secret? Salt! Seriously, you have to season throughout this meal. I season the mushrooms with some salt after I clean them. I season my flour with salt and a ton of other herbs. I then add a bit of extra salt to the breadcrumb mixture (though not a lot since I tend to purchase the seasoned breadcrumbs.) I have seen some chefs go as far as salting their deep-fried meals after it comes out of the oil, but I find if you season throughout this recipe, you should be good without that final step. Also, you will probably dip these mushrooms into your favourite sauce! My sister swears by ranch dressing, and while I enjoy it to, the last time I made these, I preferred them with a garlic aioli! Clean mushrooms and sprinkle with some salt. Set aside while you prepare your breading station. Bring out 3 descent-sized Tupperware containers with lids. These will be part of your breading station. Alternatively, you can use mixing bowls if you like. Working in batches, place mushrooms in flour mixture. Put on lid and shake until mushrooms are fully coated. Transfer those mushrooms to the egg mixture and shake until fully coated again. Finally, move the mushrooms to the breadcrumbs and shake until evenly coated. Place coated mushrooms on a separate, clean plate and repeat until all mushrooms are coated. Pour enough oil into your pan that will allow you to deep-fry the mushrooms. Anywhere from 1-2 inches. Heat to 350F (a candy thermometer is best here.) When the oil is hot, add the mushrooms in small batches, about 6 mushrooms at a time. Deep-fry for 6-10 minutes, flipping them halfway through so you get a nice, golden brown colour on the mushrooms. Times will vary depending on your temperature. NOTE: Oil temperature will drop drastically when you add the mushrooms in, so before you move onto your next batch of mushrooms, make sure the oil reheats to 350F. Remove from oil and place them in a bowl that is lined with paper towel to catch any oil drippings. Cook until all the mushrooms are completed. Serve with ranch dressing or your favourite dipping sauce! I have stated this before but I find deep-frying is the only way to get a true, crispy layer. Then again, I have never baked my breaded mushrooms either. I know deep-frying is not the healthiest of cooking methods, but sometimes you want that crunchy goodness that only oil can achieve. Trust me, it is not like you are eating these every day! You can indulge! The first time I deep fried donuts, I so was paranoid I was going to cause a fire! But it's a lot safer than it looks! Mushrooms are my favorite, and this is such a great recipe!! I will have to try it out for sure!! I thank you and my husband thanks you for this recipe. 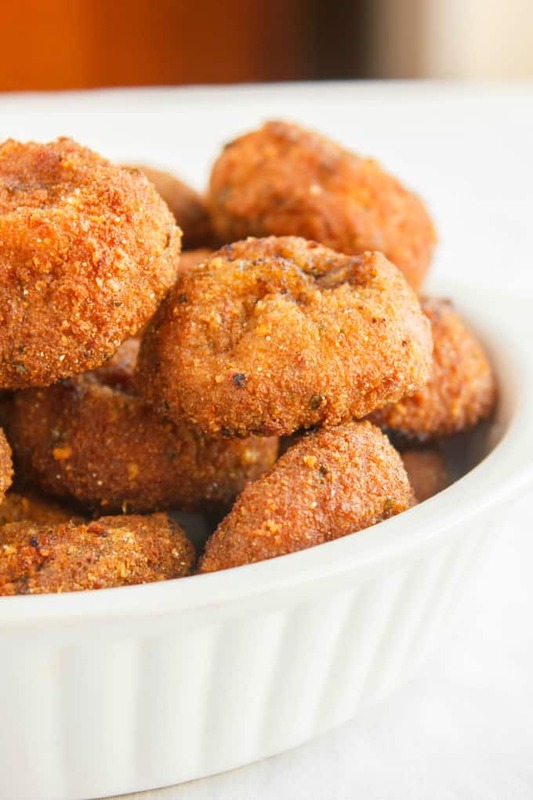 We love breaded mushrooms and now we can try making them at home! Haha, I am so happy to please the two of you! Hope you enjoy them! 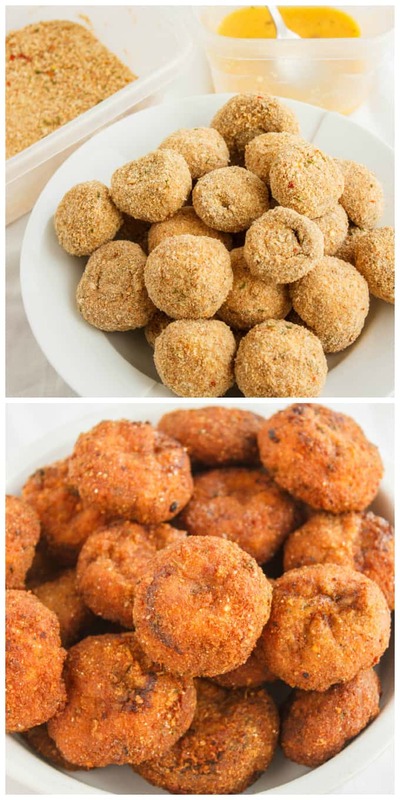 I've never made fried mushrooms before and these look so good - I need to do it. Pinned! Really, really easy. Just a bit of extra clean-up in the end! Such a creative recipe! I can't wait to try these. My husband would LOVE them! My husband can never get enough of them even though he says "they are alright." Such a liar! Oh my gosh, these look amazing! We're obsessed with mushrooms so I definitely need to make them! You will only become more obsessed with mushrooms after trying this one! Lordy this sounds so AMAZING! Can't wait to try it out! I know exactly how you feel regarding the oil, but I have an excuse. My dad got severely burned by oil on the stove when I was a teenager. It was just me and him home at the time.Very scary experience. It freaks me out when I see people not being careful with oil. It took me years before I would even use a deep fryer. But thanks for the recipe - been searching for one that interests me for a while. I'll have to try this one soon. That is such a scary experience!! Memories like that do not go away. I think I would definitely feel more comfortable with a deep fryer. It isn't even uncommon for people to use them outside. I hope you get to the recipe soon! Thank you for a great recipe. Can you let them cool down then re heat in oven a little later? So sorry for the delayed response! I am thinking maybe a warm oven (low heat.) Does your oven have one of those warming drawers at the bottom? That may help, too. I have never thought of it, but your question is totally valid! Great recipe. One improvement. Instead of coating with salt before and incorporating salt in the flour mixture, put the salt in the egg-milk. It will dissolve and give a more uniform coating on the mushrooms while using less salt. Also try serving with my favorite dip: drawn butter. Enjoy. this turned out beautifully! shared with our son's who are all under ten, so i never added any chilli, but it was really delicious! shared on my group fb page. To be honest, Mary, I don't know. I've never done it. NO! They would be soft and tasteless. Don't forget to invest in a fryer. I have the Black&Decker with the oil tray at the bottom Safe, safe and easy to clean in the dishwasher. This is a great recipe, but......ahem.......I have tweaked it a little and added some Garam masala and some cumin. Thanks to you we have breaded mushrooms tonight......albeit.....tweaked by me. Hi... Just want to ask you..are those mushroom crispy from inside or mushy?